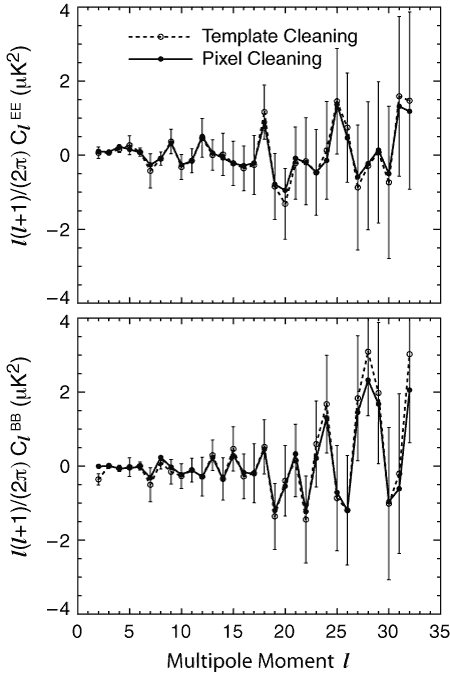 WMAP Three-year Paper Figures, Kogut, et al. 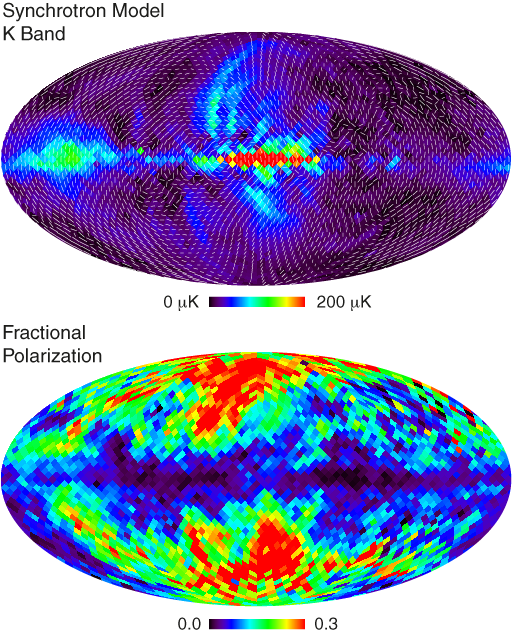 Estimated signal variance at each WMAP frequency band for 3.°7 pixels. 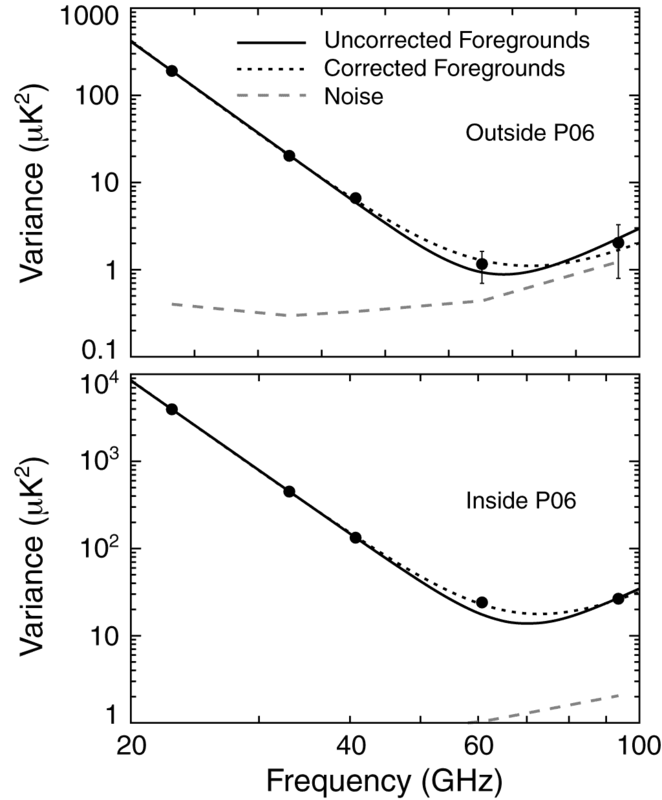 The solid line shows a two-component fit with power-law synchrotron and thermal dust emission assuming no spatial correlations between the two components. 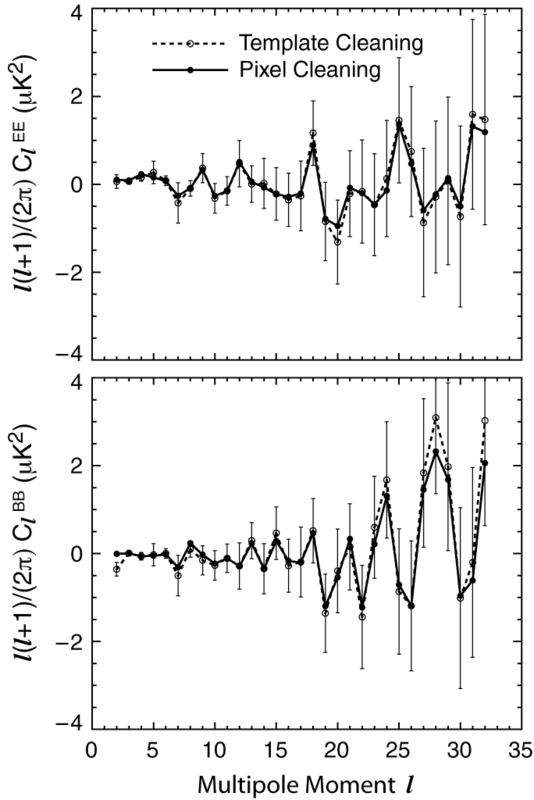 Spectral index of polarized synchrotron emission between 22 and 33 GHz (Mollweide projection in Galactic coordinates). The map has been smoothed with a position-dependent tophat varying from 7° radius near the plane to 18° radius at high latitude. 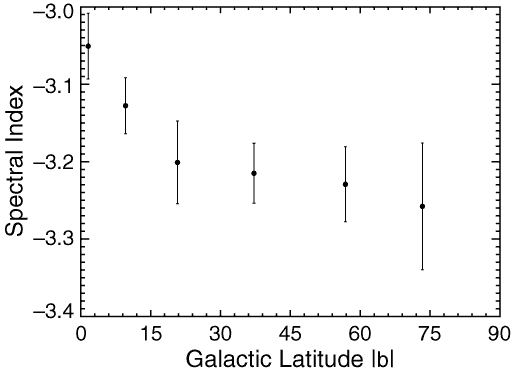 Spectral index of polarized synchrotron emission binned by Galactic latitude. 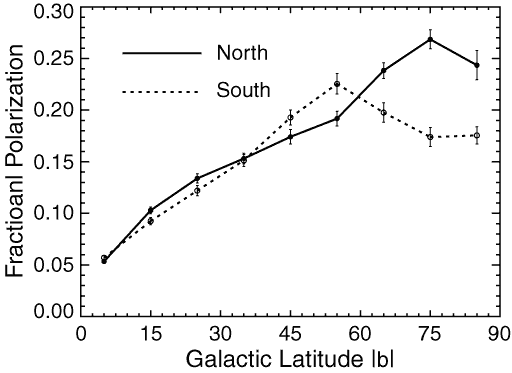 The spectral index steepens off the Galactic plane. 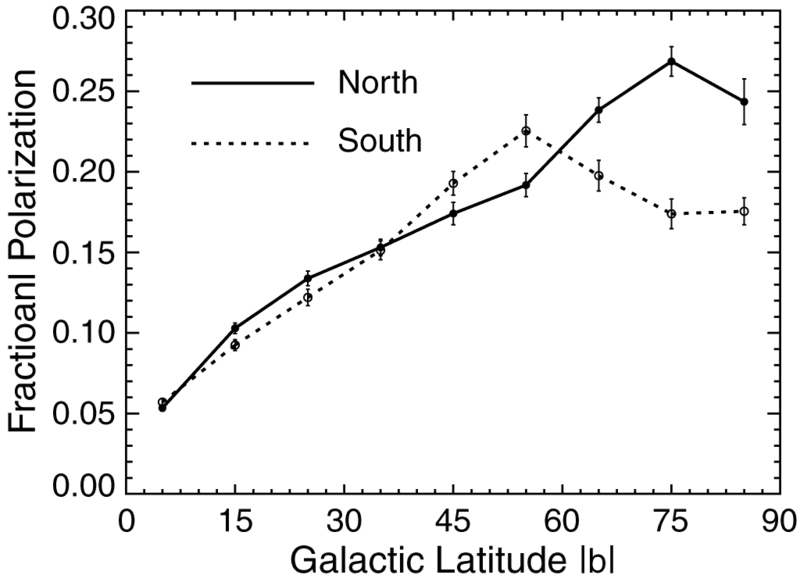 Similar behavior is observed in external edge-on spiral galaxies. P = (Q²+U²)0.5 of polarized synchrotron emission at K band. Vectors indicate the polarization direction. (Bottom) Synchrotron fractional polarization, derived by dividing the polarized model by the unpolarized maximum-entropy synchrotron model at K band. 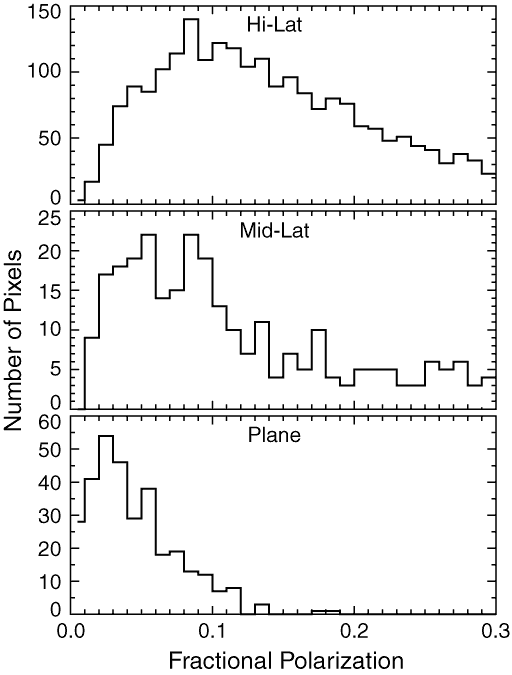 Histogram of synchrotron fractional polarization fs. 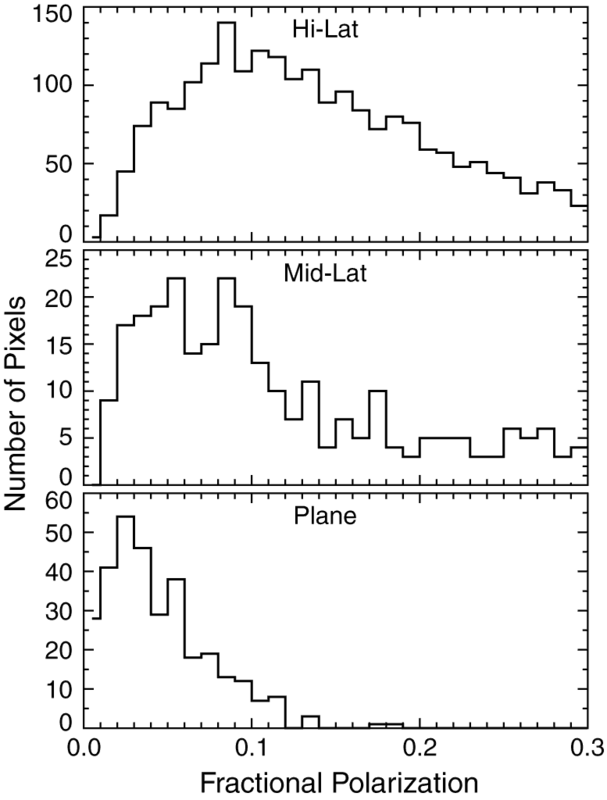 (Top) High latitude region outside the P06 mask. 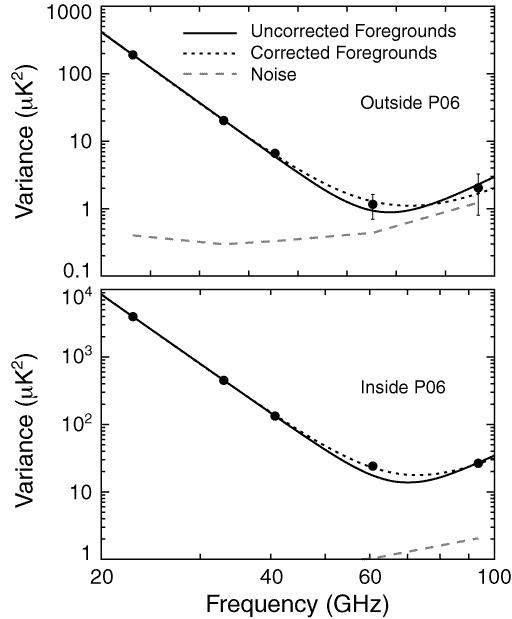 (Middle) Mid-latitude region inside P06 but with |b| > 5°. 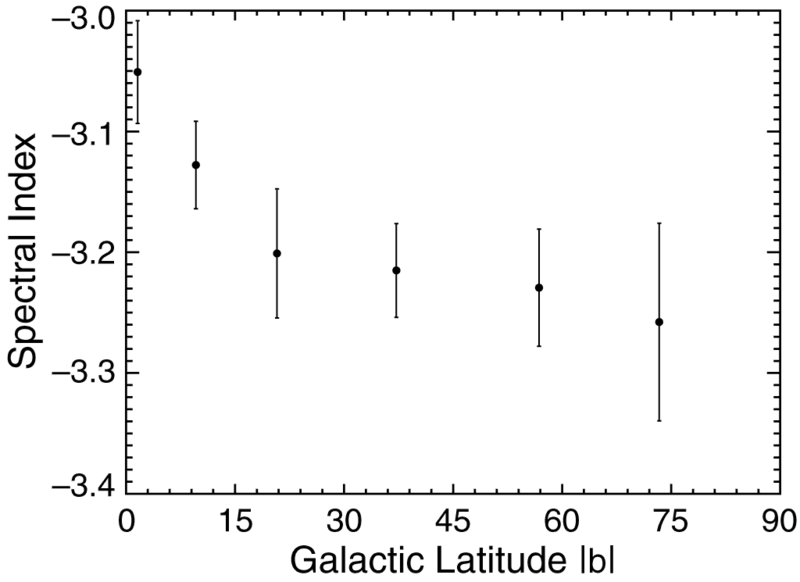 (Bottom) Galactic plane, |b| < 5°. Synchrotron fractional polarization fs binned by Galactic latitude for the northern (filled symbols) and southern (open symbols) hemispheres. Each point shows the mean fractional polarization fs for all pixels in a latitude bin with signal-to-noise ratio greater than one. 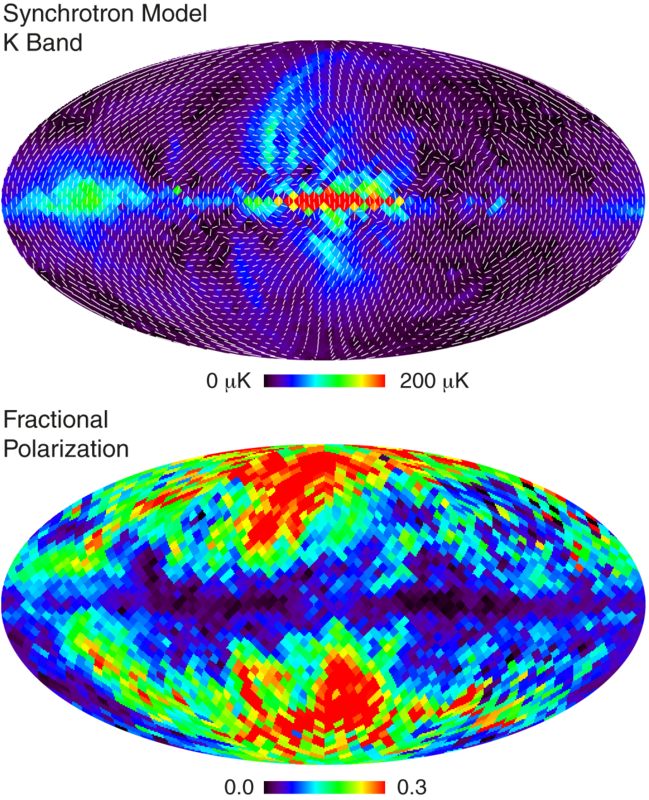 Polarized foreground model and residuals for the pixel-by-pixel polarization model. 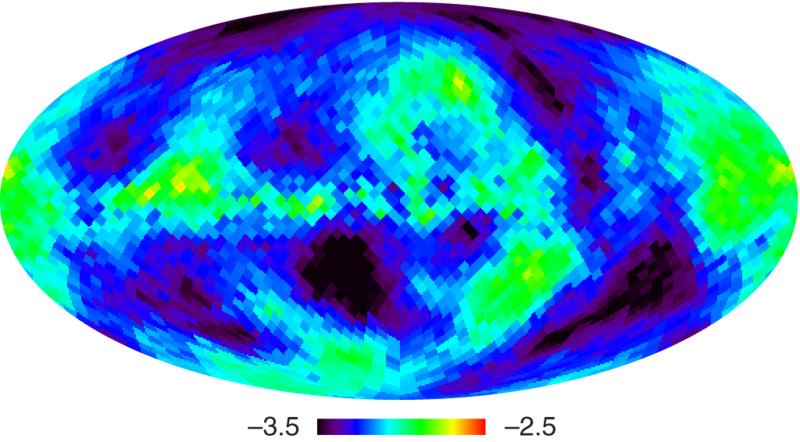 (Left) Antenna temperature of polarized emission at each band. The polarization direction is not shown. (Right) Residuals after subtracting foreground model. 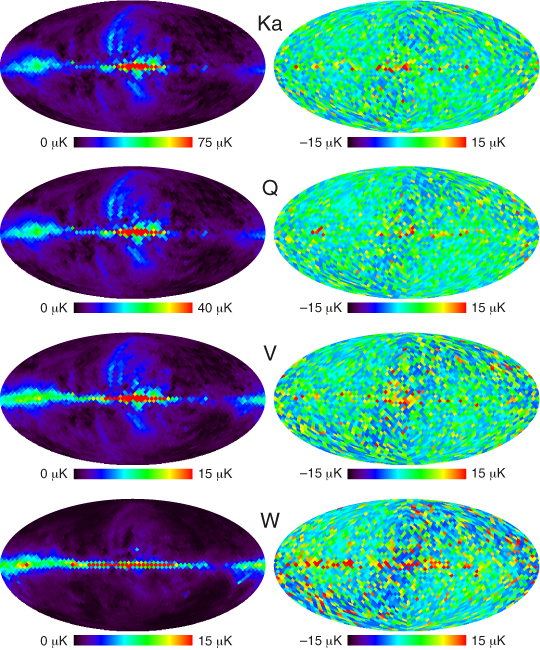 CMB power spectra outside the P06 mask, derived from Q and V band data after subtracting two different foreground models. (top) EE power spectra. (bottom) BB power spectra. 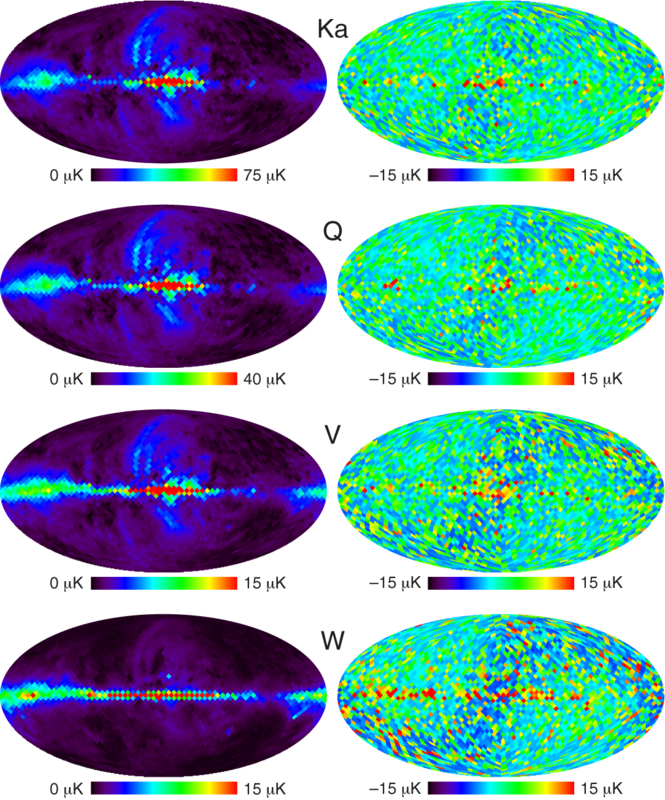 The CMB spectra are robust with respect to different foreground models.